Should the U.S. Military Stay in Syria after ISIS? Originally published under the title "After Islamic State: Staying in Syria?" 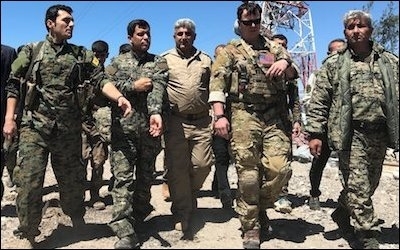 A U.S. military commander with Kurdish fighters in northern Syria. As the war against Islamic State as an entity controlling territory comes to an end, discussion is turning to the question of whether the US should retain for the long run its current troop deployments, mostly concentrated in areas held by the Kurdish-led Syrian Democratic Forces (SDF) in northern and eastern Syria. Simply put, the answer depends on how the US interests behind retaining these deployments are defined. One line of argument could be that it is in US interests to stabilize the SDF-held areas through continued training and development of forces as well as providing reconstruction aid, helping to ensure that Islamic State (ISIS) does not re-emerge in those areas where it first exploited a vacuum to develop its state project. The US could be seen as owing an obligation to the SDF for its key role in fighting ISIS and thus required to protect it from adversaries such as Turkey, which regards the SDF as a terrorist organization by virtue of its links to the Kurdistan Workers' Party. The US, it could be argued, should also not risk losing even more influence in the wider region by being perceived as abandoning its allies through a troop withdrawal. These justifications, regardless of whether one endorses them, at least make some sense. Yet the focus is instead turning toward the notion that the US presence in the SDF areas can serve as leverage to bring about a transition away from Bashar Assad regime in Damascus and counter Iranian influence in the arc stretching from Iran to the Mediterranean. Here, unfortunately, the logic collapses. 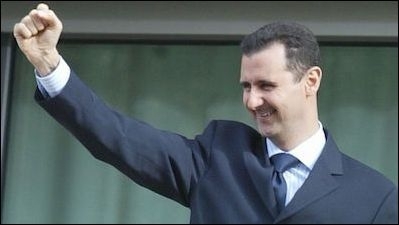 Syrian President Bashar Assad refused to contemplate transitioning out of power even when he appeared to be losing the civil war a few years ago. To begin with, the Democratic Union Party (PYD), the Kurdish authoritarian socialist party that is the main political power behind the SDF, has never been part of the regime-opposition dichotomy that has been the primary driver behind the civil war. While opposition forces (aka the rebels) still control territory in the northwest and south of the country, these are holdings of marginal importance compared to cities like Damascus, Aleppo and Homs. The regime, which refused to countenance a political transition even when its position was far more precarious, feels even less pressure to negotiate with the opposition on the matter. For the PYD, the concerns have been much more limited: namely, establishing an autonomous zone of governance in its areas of control, a goal that does not necessitate regime change in Damascus. It is certainly true that the SDF has some leverage over the Syrian government, such as through controlling important oil fields in part of the eastern province of Deir az-Zor. This leverage, however, is not such that the regime can be made to agree to do away with itself. Rather, at best, Damascus may concede some formal recognition of SDF autonomy. In other respects the SDF has failed to acquire further leverage that might guarantee that outcome. The recent race for the town of Albukamal on the eastern border with Iraq was won by the Syrian government and its allies. As a result, the Syrian government now has access to a crucial land trade route with Iraq. The fact that the SDF faces a hostile Turkey compels it to do business with Damascus. In any case, the fact that the SDF faces a hostile neighbor to its north (Turkey) means that it is compelled to do business with Damascus and the Iraqi government if it wants to survive economically rather than depending indefinitely on handouts of American aid. Further, the US presence in the SDF areas does not serve as an effective counterbalance to Iran, as it does nothing about the presence of Iranian forces and allied militias in regime-held areas. Indeed, Iran's key means of supplying its allies in Syria and Lebanon – namely, the air corridor – remains wide open and fully functioning. In the unlikely event that this air corridor were to be fully disrupted (e.g. if a no-fly zone were to be imposed over all of Syria), there is still theoretical access to a long and arduous land route following the capture of Abu Kamal. In sum, there is a reasonable argument to be made for the moral principle of standing by one's ally on the ground and taking responsibility for rebuilding places like Raqqa that have been largely destroyed by the campaign to retake them from ISIS. From the strict counter-ISIS logic, there is sense in staying in that the US presence can be seen as preventing an all-out war between the SDF and regime, which regards the SDF-controlled oil fields in Deir az-Zor (for instance) as occupied assets that ultimately need to be reclaimed. It is reasonable to argue that stopping a future SDF-regime war prevents the creation of a new security vacuum that might allow ISIS to return. A U.S. military presence in Syria won't bring about a political transition or counter Iranian influence. But claiming that a long-term presence will bring about a political transition in Syria and counter Iranian influence in the wider region lies in the realm of fantasy, unless the US wishes to expand the troop presence into the tens of thousands and encourage an active SDF campaign against the government and its allies to acquire far more territory. There is no sign though of such an option being seriously countenanced. In the end, it needs to be recognized that the US has failed to link the counter-ISIS campaign to bringing about a fundamental shift in Syria's political environment. If the insistence is to focus on countering Iranian influence in the wider Middle East, then efforts should be directed elsewhere in the region.